Amazing collection of hidden storage ideas for all parts of your home (inside and out) that you’ll want to use straight away!. Get started today and make the most of every square inch of your house – maximise it’s potential! I love finding ways to maximise the space we have in our homes – especially in UK homes where space tends to be tight to say the least! In fact – when we moved into our home there was absolutely ZERO storage there. No wardrobes, no cupboards – NOTHING. So over the years we’ve created cupboards in alcoves, added in shelves behind doors etc.. – and created storage where we can. But we’ve yet to create hidden storage – and so I wanted to be inspired and took a look around to see what I could find. It’s amazing how many totally fantastic ideas there are out there, so I just had to share a few with you. This is my roundup of some of the best ideas I’ve found. Hopefully they will inspire you to be creative and make the most of what space you have…. I love this idea for having storage within shelves. It’s a great option for bedside tables (as shown), or I would also look at using for a home office for pens or wires, or as somewhere to keep valuables when away on holiday. The options are endless! Baths are the biggest piece of furniture in a bathroom, so why not make them work even harder and make the space pay! Having panels that can be removed means that you can store cleaning items, bath products etc… – perfect for a small bathroom with little storage. Follow this blog for any length of time and you’ll find me waxing lyrical about storage beds. I LOVE them! You can read all about why I love them so much HERE, but for now, i’ll just say that they totally transform a bedroom because of the amount of storage they provide. I have a storage bed in all bedrooms in my home now, and as it’s a 1930’s home with no built in storage whatsoever, it’s been a life saver to say the least! This would be a great way to store little things that often get left on show. I would use in a hallway on the table and store spare keys in it so they’re accessible but totally hidden from view. WOW. Just WOW! What an easy idea to make storage behind pictures! Just pop a hinge on one side and voila, you’ve got all those little items easily accessible, but totally hidden away. I love the idea of both of these pictures, and may well start using both in my home very soon! This was a great example of how a headboard can provide storage, and you can now buy storage headboards if you take a look around – but this one was made using IKEA shelves – (just click on the picture or credit link to see the full HOW TO) and it’s so effective. I don’t want to forget storage for outside in this roundup, and I have really fallen for the idea of using plant pots to hide those ugly but necessary items such as a hose. One of my favourites, and it can hold an amazing amount of jewellery. I can see this in a teenage girls bedroom very easily, and it would definitely take clutter off the dressing table or shelves! A really good DIY version of a storage mirror, and this one caught my eye because it can hold so many things so beautifully. 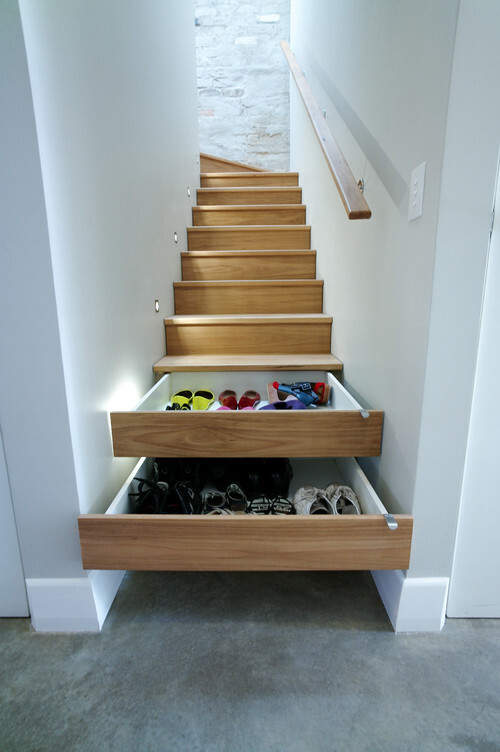 Yes, Yes, these would need to be done by a professional – but wouldn’t it be worth it to have the space around the stairs being put to good use? I think the second idea would be really useful for a home that didn’t have a loft/attic for larger items. You could easily store a suitcase or two there, or your Christmas decorations – out of the way but easy to grab when needed. Last but not least – what a great idea for storing expensive small items when you’re away. What burglar would think of checking a socket for the valuables?! My favourite hidden storage ideas from around the web, and I hope they’ve inspired you to look at the space you have in different ways.